We’re sitting in a café in the Woodbine neighborhood of Nashville — not far from the home of Shaneka McCarter and her boyfriend — enjoying a cup of tea on a cold day in October. Just a few months ago, in late February 2017, Shaneka and two friends traveled from home in Nashville to Baton Rouge, Louisiana to visit a friend’s father. By a stroke of luck, it just so happened that their plans coincided with Mardis Gras weekend. On their first day in town, the three friends made a trip to nearby New Orleans, saw the sites, visited Bourbon Street, and enjoyed the festivities. They heard all about the legendary Mardis Gras parades and decided they couldn’t resist coming down from Baton Rouge again the next day to see the fanfare. But the following morning, while sitting in traffic on their way into the city, a driver rear-ended their two-door Altima coupe, propelling it into the vehicle in front of them. In an instant, they become part of a four-car pile-up. Shaneka, who was in the back seat, has no memory of the collision. For her, time leaps from waiting in a traffic jam to waking up in the emergency room at University Medical Center. Shaneka’s two friends suffered minor concussions and seatbelt burns, but Shaneka’s injuries were far more severe: Her upper and lower jaws were crushed. Her face and forehead were fractured in more than 15 places, causing peril to her nose, teeth, and eyes. In fact, Shaneka’s facial skeleton was so damaged by the impact during the accident that, in the self-portrait she showed me on her phone from the day of the crash, her lips were too swollen to close, revealing a single front tooth. Her nose was visibly broken, and the right side of her face, including her eye, was sunken down, like a clock-face in a Dali painting. That’s when Shaneka met Dr. Gerhard “Sol” Mundinger, a plastic surgeon at LSU. He lead the analysis of Shaneka’s injuries, and the reconstructive surgery that lead to her recovery. 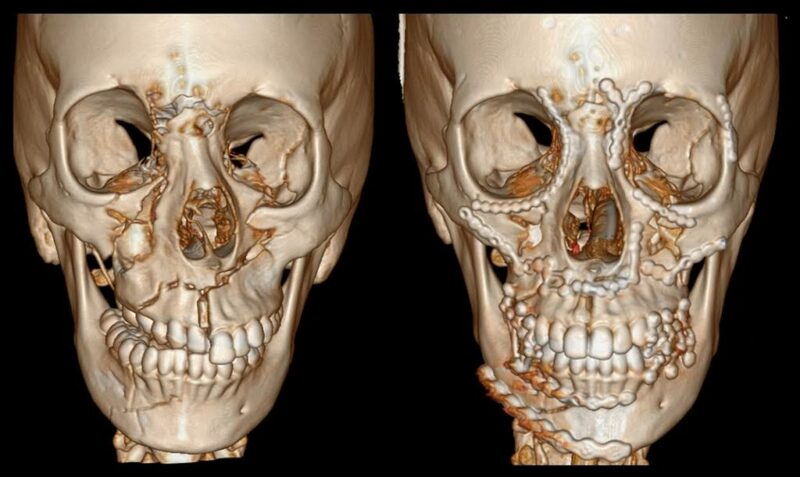 CT Scans of Shaneka’s facial skeleton. Left: Before surgery; Right: After surgery. What is Post-Traumatic Facial Reconstructive Surgery? Craniomaxillofacial trauma, or trauma of the skull and face, often causes complex bone and tissue injuries requiring immediate and expert attention in order to diagnose, treat, and ensure the best recovery possible. In post-trauma reconstruction, the New Orleans Craniofacial team employs the latest diagnostic and surgical tools, including techniques like Virtual Surgical Planning® and technology for preoperative surgical planning technology, such as high-resolution CT scanners and three-dimensional CT formatting, to help our team help our team diagnose and define a course of care for craniomaxillofacial injuries. Surgical care is generally carried out once the patient is in stable condition in the hospital. At that point, once the team has stabilized a patient’s fractures and reduced any movement of the affected bones, pain from these fractures will be relatively minimal. During the surgery, access incisions may be made in the mouth, eyelid, or brow, or hairline depending on the locations of the fractures. Recovery time can vary depending on the nature and extent of the injuries, but your surgical team will consult closely with you on post-surgical instructions and follow-up care. Everything had gone wonderfully: Dr. Mundinger had aligned and wired the broken pieces of Shaneka’s jaws back together, corrected her orbital shape, and paid careful attention to reconstructing the soft tissues on her face. Because her jaws were so badly damaged, he determined it would be necessary to keep her upper and lower jaw wired together for a few weeks to ensure her teeth, which had been severely displaced, healed in the best possible position. But the recovery would take longer. “One of my eyes was pushed back more than the other. Dr. Mundinger told me that if I had vision problems, I’d need another surgery. Luckily, that didn’t happen.” Shaneka thought it would take much longer to recover, but in all, she said, it was about a month and a half. Shaneka’s healing process called for eating liquified food via a syringe during the six weeks following the surgery, during the time that her jaw was wired shut. During the period that Shaneka’s jaws were healing, she lost twelve pounds — and between the weight loss and her healing face, she didn’t quite feel like herself. In some ways, that may be true: The skeletal and jaw reconstruction Shaneka underwent after the accident not only saved Shaneka’s teeth, but even served to correct an underbite Shaneka had had before the accident. One of Shaneka’s family members who was savvy on social media shared a photo of her, and invited prayers from family and friends. She said those prayers helped her get through it, along with the incredible support of her mother and sisters, and of her boyfriend, who took care of her while her jaw was wired, and throughout her recovery. 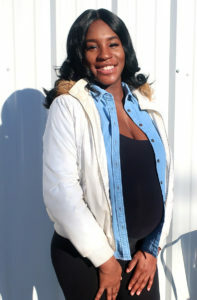 Now, she tells me, she and her boyfriend are expecting their first child — with a due date right around Christmas.